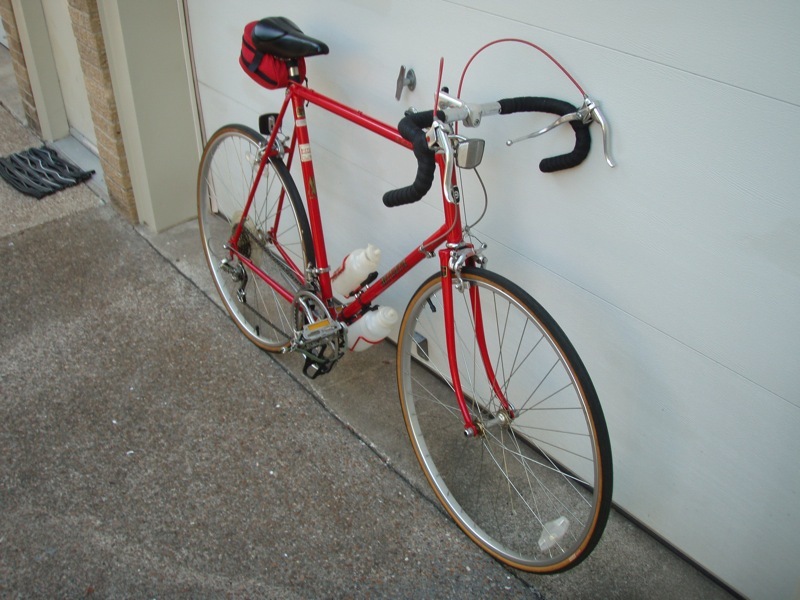 Here’s pictures of my great old 25” (twelve-speed, sorry) Miyata One Hundred that I bought in 1984. It was a leftover 1983 model. The chain and freewheel aren’t original (I actually broke the chain(!) during a vigorous acceleration), and I just recently replaced the handlebar tape. It still has the original tires! I rode it a bunch until I bought a new lightweight super-stiff fat-downtube Cannondale Criterium Series SR300 in 1986. I can take pictures of it, also, if you want them. 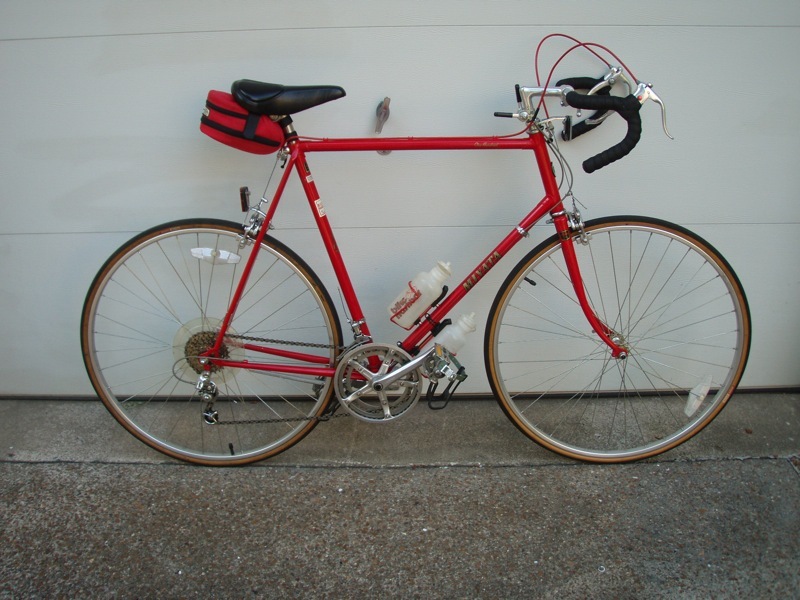 I had a nice, old chrome-fendered blue electro-forged Schwinn “Collegiate”, I think, 5-speed (that I put drop bars on) before and during college, but it’s frame was really much too small for me, and stretching out on the Miyata felt like I was riding a Cadillac. A couple of days (or maybe even a couple of hours) before, I actually bought a brand new black Schwinn World Sport, but it had to be bent or somehow out of alignment because it pulled to one side terribly and I couldn’t ride it no-handed no matter how far I leaned to correct. Looking back, it was probably a fork that was tweaked during shipment? When I brought it back and explained to the salesman, he said: “We don’t recommend riding no-handed.” I was a little shocked, and immediately tried to explain again, but he stuck to his line! 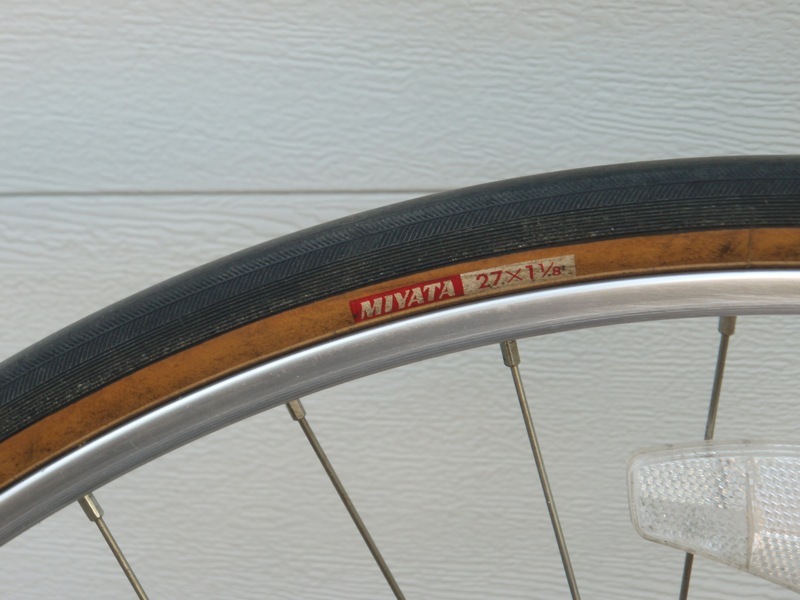 So I asked for my money back, walked over to the other dealer, and bought the Miyata. Now that I realize it was a tall model that they probably had a hard time selling, I could have talked him down, but oh well. That was a long time ago, aye? 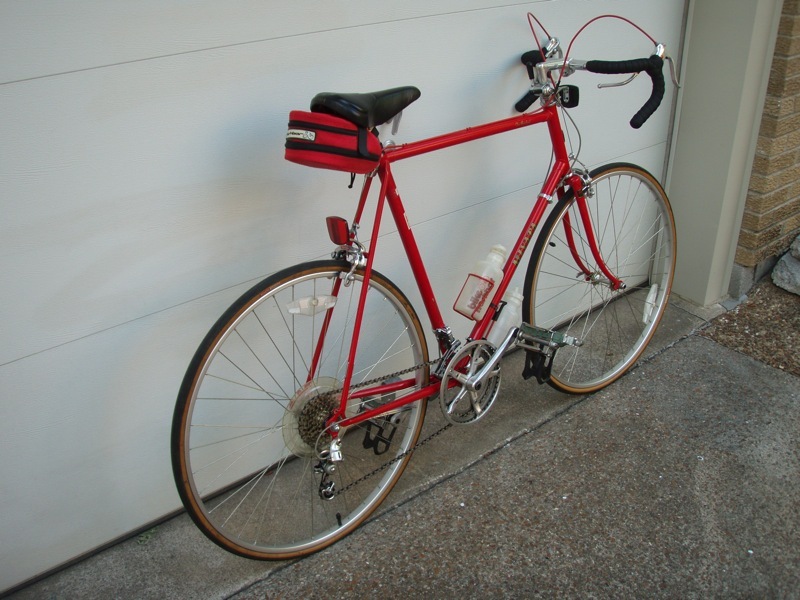 For a while, it was equipped as a “touring” bike with: randonneur bars, “Carlton”-hooded levers, GB stem, cushy Spenco grips, old Brooks saddle, Zefal? frame pump, fenders, Blackburn rack, and lights, but I took them all off and put the original parts back on it only recently. 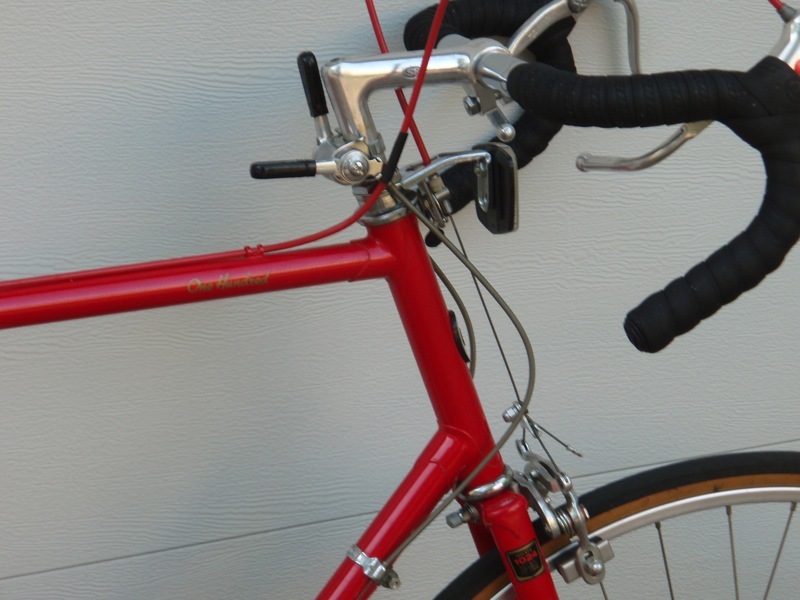 The original handlebar tape must have gone to another of many refurbished bikes lost to my memory. Due to the hilly terrain of the area I moved to in 1993, and none of my bikes having a small chainring granny gear, the next, and last, new bike I bought was a Trek 820 in 1993 or 1994, but since it’s a 21-speed MTB, it definitely doesn’t qualify as an OTS!